Paularino (1886) came first, and was really more of a little farming settlement than a town. It’s borders were between what is now Fairview Road and Newport Boulevard, the San Diego (405) Freeway, and a line about a half-mile south of Baker Street. It was referred to as “The Boston Colony” because the two dozen families that settled there came from Massachusetts. Fairview (1887) was a boom town that appeared near today’s intersection of Harbor and Adams. 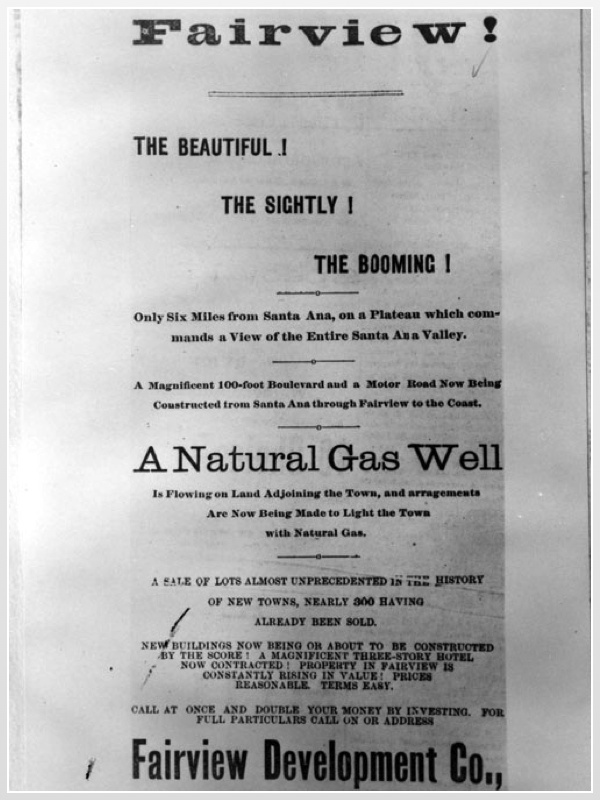 Due to the Orange County land boom, a syndicate bought the land, subdivided and laid out a town. But when the land boom bubble burst, Fairview collapsed, and by 1911 all that remained were the schoolhouse, the hotel and a few scattered houses. 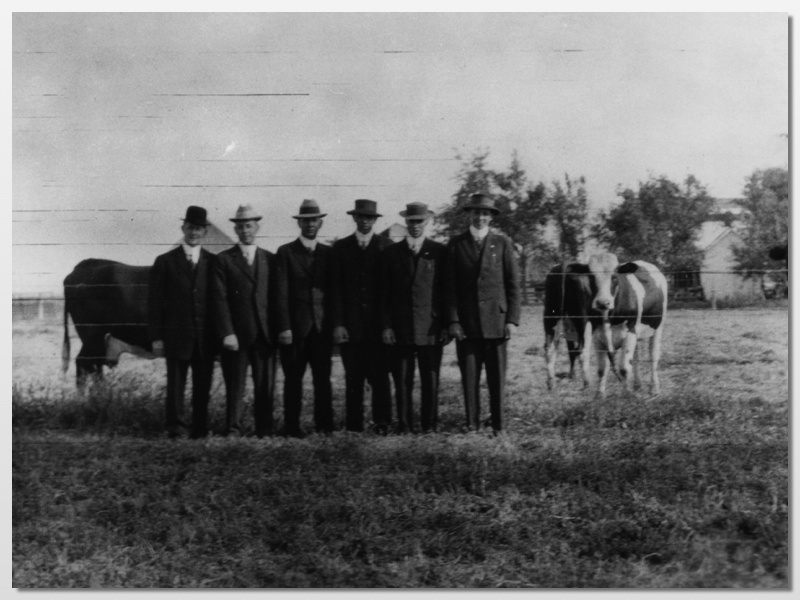 Harper (1891) was named after Gregory Harper, Jr., a rancher who came to the area after the Fairview boom. But unlike the tentative start of it’s neighboring settlement, Harper was able to put down roots because of the arrival of grain farmers and the railroad to export their crops. The little village, on either side of present day Newport Blvd and south of 19th street, soon had its own school (on the site near the Harp Inn on 17th Street) and Ozument’s General Store at the intersection of Newport and 18th Street. But arguably the most significant event in city history happened when Charles John (C.J.) 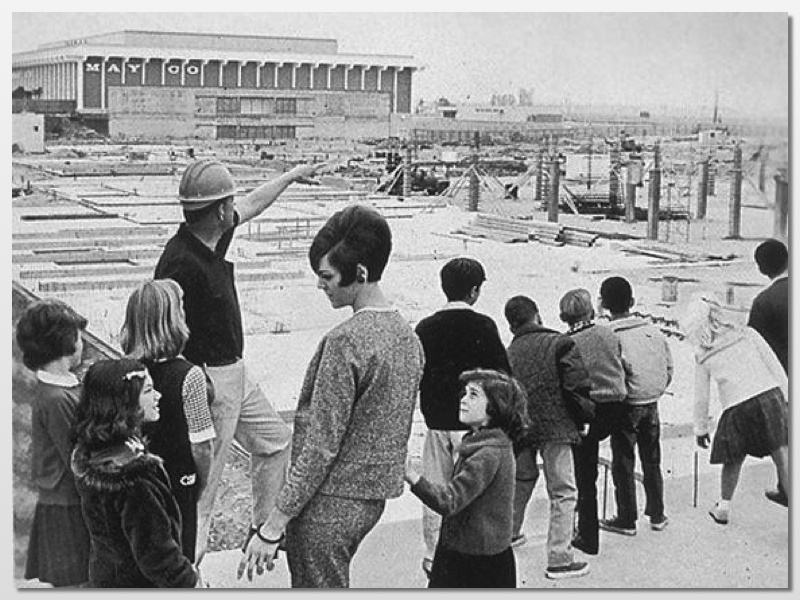 Segerstrom made a wagon trip to present-day Costa Mesa and fell in love with the land — flat and rich enough to grow anything he wanted. At first, he grew alfalfa which fed the cows for a dairy farm. Segerstrom’s large family of 11 children all pitched in. He eventually bought the 40-acre piece of land on Fairview Road north of the San Diego Freeway and even more land in 1940. After establishing a water supply, Segerstrom began to grow what would be his most successful crop; the lima bean. Even though the Segerstroms built a successful agricultural empire, their real success came later, when third generation member Henry T. Segerstrom led the family’s transition from farming to real estate development. Today, their flagship property, South Coast Plaza, earns over $1.5 billion in sales annually, more than any other shopping center in the United States. Costa Mesa is Orange County’s City of the Arts. 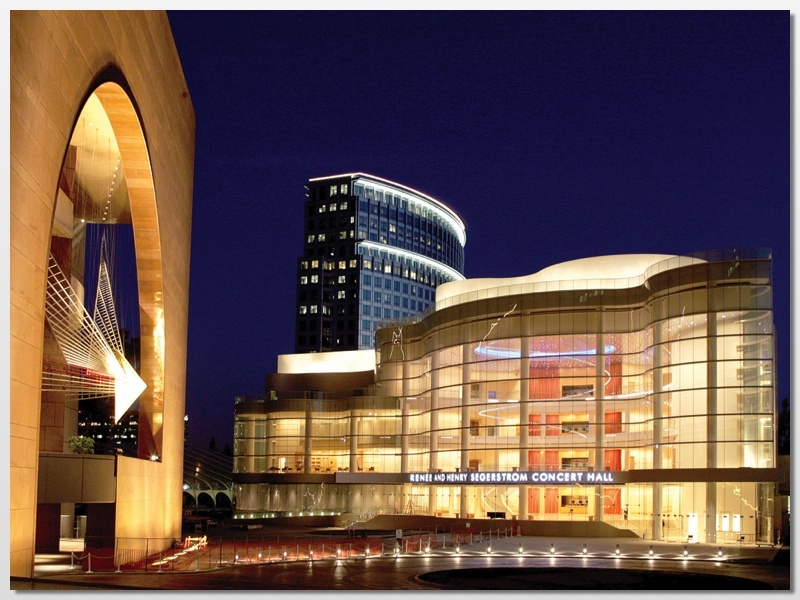 The Segerstrom Center for the Arts is home to The Pacific Symphony, Pacific Chorale and the South Coast Repertory. It also attracts major Broadway national tours and concerts. In other words, instead of driving all the way to Los Angeles to see excellent performances, Orange County residents have great cultural options right in their own backyard. 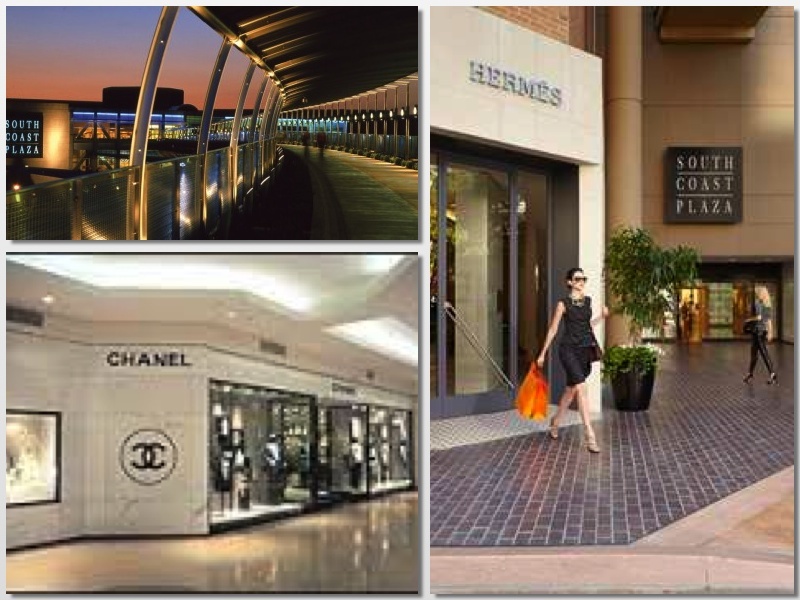 South Coast Plaza still leads the way as a first-class, shopping destination. Visitors travel from all over the world to shop at SCP’s collection of boutiques. South Coast Plaza is no ordinary shopping mall. There is no food court, no cell phone kiosks. Shopping at South Coast Plaza is a first-class, pleasant experience in a beautifully decorated and impeccably maintained center. 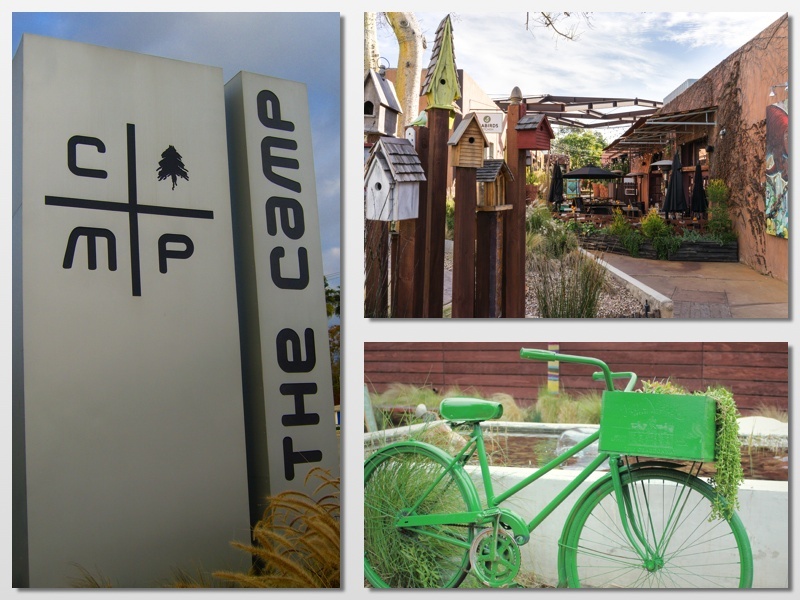 Costa Mesa is also home to my favorite alternative shopping malls; The OC Mix and The Camp/Lab on Bristol. 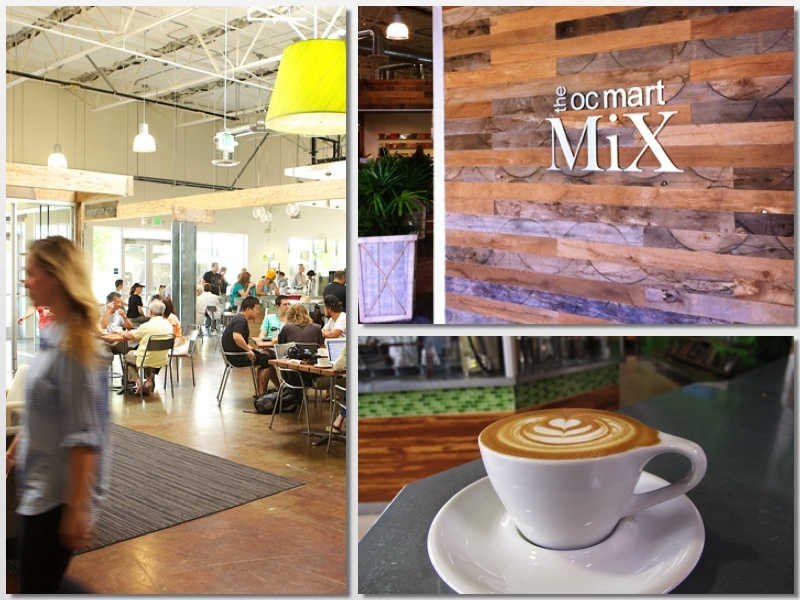 The OC Mix and SOCO (South Coast Collection) a district of 70 design and culinary stores. You don’t have to be an interior designer or a chef to enjoy this place. It’s the perfect destination for inspiration. I love grabbing a latte at Portola Coffee Lab and wandering through the eclectic collection of shops. The public space is one of my favorite places to plug in my laptop and work away from my desk for awhile. The Camp and The Lab are right down the street from South Coast Plaza, but they couldn’t be any more different. In fact, these sister properties are considered “anti-malls” because of their unconventional, unstructured design and unique, local offerings. My favorites? Sunday Brunch at Old Vine Cafe, a taco flight at Taco Asylum. and Happy Hour cocktails at Memphis.